One of the most relevant demographic indicators is that which refers to the life expectancy of the population. There has been a significant positive trend in this indicator in the Basque Country in recent years, according to the latest data available from Eustat and Eurostat, given that life expectancy in 2005 stood at 77.2 years for men and 84.3 years for women, and in 2015 it stood at 80.3 and 86.2 years, respectively. This last figure is the highest for any country in the EU-28. It is also the highest figure in relation to the average for all the EU-28 countries, which was 83.3 years in 2015.
n Spain, the figures were 80.1 for men and 85.8 for women in 2015. In relation to the rest of the EU-28, the Basque Country headed the ranking of life expectancy of women in 2015. Just behind it at the top of the list were Spain (85.8), France (85.5), Italy (84.9), Luxembourg (84.7), Finland (84.4), Portugal (84.3) and Sweden (84.1). By contrast, the lowest life expectancies for women in the EU-28 were recorded in Bulgaria (78.2), Romania (78.7), Hungary (79.0) and Latvia (79.5) and Lithuania (79.7). 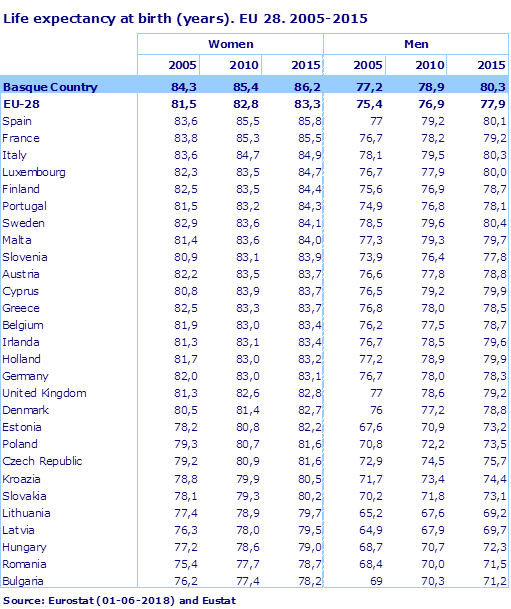 In the case of men, the Basque Country, with 80.3 years, also greatly surpassed the average for countries in the EU-28 (77.9) in 2015. In the life expectancy ranking it was only the Swedes who lived longer, 80.4 years, followed by the Italians (80.3). Following these were the Spanish (80.1). Occupying the bottom of the list, due to having the lowest life expectancy were Lithuania (69.2), Latvia (69.7), Bulgaria (71.2) and Romania (71.5).